Prema Natya Vidyalaya is the Bharata Natyam Dance School of Divine Love. I teach Bharata-natyam, a style of classical Indian dance, in the Kalakshetra style in the lineage of V.P. and Shanta Dhananjayan. Bharata-natyam, literally meaning the ‘dance of India’ is an ancient classical dance form. It combines bhava (emotion), raga (music), and talam (rhythym), for a complex and intriguing art that is fascinating to watch, and a joy to perform. For the students of Prema Natya Vidyalaya, dancing is a true act of devotion. The foundation of the practice is an offering to Sri Sri Radha and Krsna, not merely an exercise of movement. There is a deep significance to the name of the school that I think worth sharing. After teaching dance for a few years, I realized I needed a school and a name for my school. Names give things identity, and bring them to a more realistic level. After some thought, I chose to ask my diksa-guru, B.V. Swami Tripurari, to name my school. After consideration he named it Prema (divine love) Natya (dance) Vidyalaya (place of learning), the Dance School of Divine Love. He chose it with this verse from the Caitanya-caritamrita in mind. 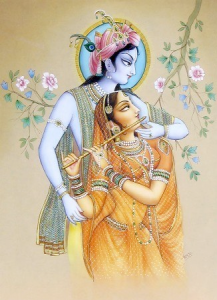 He said that Prema-Natya is the dance school that Krsna attends. Thus with this auspiciousness my dance school began. I find it a most fitting name, and it has given shape and meaning to my teaching. Dance for me is an intimate service to the Divine Couple. It is my way of using my mind, body, emotions, and thoughts in seva (service). It is my way of showing this world a glimpse into the spiritual realm, where every word is a song, and every step is a dance. And if the words are songs, and the steps are dances, then can we imagine what the singing and dancing of that place must be like?